Why stepping into a freezer every morning might be the secret to success. When Tim Kendall was President of Pinterest, he told me about his unusual morning routine. Elizabeth Buchanan, Wife & Mum, Entrepreneur, CEO, Board member & Passionate volunteer. 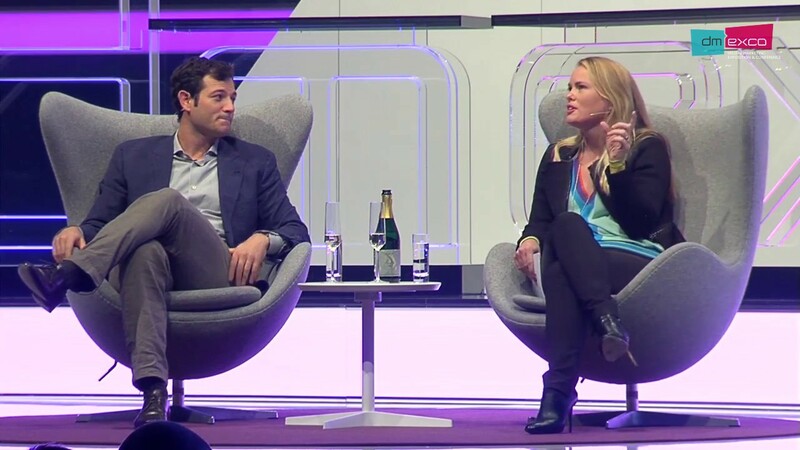 Tim Kendall & Elizabeth Buchanan @ Dmexco. Tim believes that central to their success is the executive commitment to create a culture of kind, compassionate people “which is not conventional wisdom in Silicon Valley” he says, “it actually augments your business if people can be warm and compassionate”. I heard Tim takes a bath every morning filled with ice cubes and he corrected me there — he has since bought himself a freezer which is a more efficient way to jolt the body awake. While you and I are sipping coffee, he spends five minutes in 30 degrees Fahrenheit every morning. Or as he describes it, “A mildly more extreme version of coffee.” One person’s “mildly” is another’s extreme. As someone who has travelled the world discovering for myself many different kinds of self-actualizing mild/extreme rituals, I wanted to know why a freezer? What was the effect it had on his mind, afterwards? He described it as, “Thank God that’s over.” Tim explained his physical experience needs to mirror his business philosophy. In order to focus on the most demanding task, you will inevitably disappoint people. He’s a self-described pleaser, a ‘golden retriever’ and to be effective in his job requires being impervious. He finds this equanimity in the physical discomfort of a freezer. I wanted to better understand what impact this has had on the business, in particular what has changed in the last twelve months for Pinterest? They took an axe to the ads they felt were below par. “Compromising there was mortgaging the engagement of the users in the future.” Low quality ads would turn users away and they rolled the dice and evidently made the better decision. The most attractive quality for marketers wanting to invest in Pinterest? Tim explains most people use a search engine with the brand they are looking for. With Pinterest, 97% of the searches are unbranded. It’s a free-association of what they want. Exploring without brand loyalty is exactly where marketers say they find their new consumers. “We think that whole discovery process is highly visual. Computer vision technology — and we use that to help us recommend products to users.” This however, leaves Pinterest unsure of what the future of a voice-enabled internet will mean for them, the freezer has not yet helped solve that challenge. As I drink my regular morning coffee, I look forward to following Tim and Pinterest into the future, I wish him and his team of positive pinners every success. Most recently responsible for driving transformation at OMD, an Omnicom agency, Elizabeth has had a distinguished career with more than 20 years inside marque brands including Yahoo!, Macquarie Bank, WPP and Uber. In addition, Elizabeth was the co-founder and CEO of The White Agency in Australia, which she built from a startup into the country’s hottest digital agency. Managing the full-service digital needs for clients including Telstra, Coca-Cola South Pacific and Commonwealth Bank, the business won numerous awards including Australian Business of the Year, Ranked in Top 10 Places to Work, and Elizabeth was the youngest listed in the BRW Top 20 Australian Female Entrepreneurs. Elizabeth sold The White Agency to STW Group (now WPP) and then moved into the holding group as Division Director, responsible for the Digital, Direct, Media & Experiential portfolio of agencies (20+ P/Ls). Elizabeth has a very strong social conscience and she has been dedicated to giving back through-out her career via pro-bono projects, active volunteering and NGO board roles.